The man in the hat is my friend Merlin Trotter, who works in Leicester Square. He learned tarot as a boy, at the feet of the mystical women in his family, as fathers and uncles harvested the hops that are made into beer. Merlin was too young to go into the fields with the men in those Septembers, so he learned from their wives how to hear what the talking cards said. They have been speaking to him now for more than fifty years. Merlin is knowing, warm, scrupulously honest and — gifted. He predicted a coming medical issue for me that turned out to be true, while taking care to assure me I would be all right. I was. Some of the people who consult him, he has said, have terminal illnesses. Off-duty police also ask him to read for them. He does hundreds of readings every day, in all the versions of London’s weather. In exchange for his truth, gently delivered, he charges no price. You are free to donate nothing, or many quid. It’s up to you. My novel-in-progress is about Seven Dials in London. From the beginning, there has been a tarot card reader at the heart of my story, but in several trips to that beautiful city, I had not found a single one. Musicians, yes, and Yodas, but no one who reads tarot. But then, one night, there Merlin was. Straight in from Cornwall, he told me. Born in East London, barely understandable to this American, voice gravelly from a lifetime of smoking. “But where are all the others like you?” I asked him. 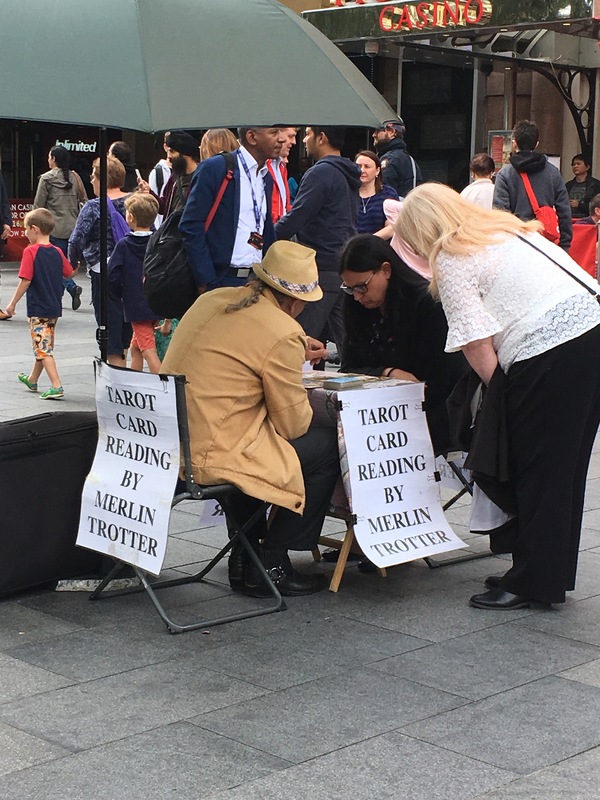 Since then, Merlin has generously given me of his time, even answering my many questions away from his post in Leicester Square, missing out on making money. He has introduced me to his friends and he has told me stories about how he has made a lifetime’s living from the kindness of strangers, for whom he genuinely cares. Merlin Trotter is a surprise, and a gift. He represents for me the very finest of London.